I don't use the Quantum Firefox, but I did a quick test and am beginning to think that the Mozilla devs have changed something between 59 and 60 which has messed things up for sound in Puppy. I tried the official Mozilla build and also the Ubuntu Trusty build and in both cases there was no audio in YouTube in TahrPup 6.0.5 even with the usual fixes applied. I also tested the official build in Stretch Pup and the result was the same. There are some warnings in terminal which I do not recall seeing before. Default sandbox level is now 4 but reducing it to 0 does not fix it so it looks like something else is preventing sound from working now. Maybe someone else has figured this out. Otherwise I will try to investigate when I get a bit more time. The ESR version 52.8.0 (released at the same time as 60.0) is working OK for me. I use the Debian builds of this in Stretch and Wheezy, but I presume the demanding websites would be happy with this version and the official Mozilla build of it should be fine in Tahr Pup with libgtk-3 and apulse I believe. You may also find that they are compiled without the auto-updater because you are expected to update via the package management system when they release newer builds. I suggest making sure that all older packages have been uninstalled/removed. Often it is good to (backup bookmarks and) delete the profile and start afresh as well when upgrading. I am currently in Stretch-Live (32bit) running Quantum 60.0 as a root user. This is the direct-from-Mozilla version gradually updated. I am starting it via "apulse /opt/firefox/firefox"
My about:config > security.sandbox is posted below. Note the new line that has appeared. I have Youtube audio working OK. When my sound wasn't working I did look in about:config and I did notice that new line there but the string value was just blank at the time. I have never known this with Mozilla firefox tarballs before. I figured I might get lucky if I copied rcrsn51's config data, so I did that. But on second thought I left the long string blank in the hope that my computer would generate its own string value. Upon rebooting my computer did generate its own string for tempDirSuffix (e63d0993-2ae5-4c9a-9649-8efce1317bab). But the value for syscall_whitelist had reverted back to "/dev/snd/" from "54". Result was negative. No sound, No video, No change. I confess, I don't see how. For a wee while now (confirmed Chrome man that I am! ), I've been using Fred's 'portable' FF-Quantum in all my Pups. I've done my usual 'trick', of running a single instance from a remote data partition, sym-linked into all Pups (with the exception of Racy & Lucid, whose components are just too old). I upgraded to version 60.0 around a week ago? and have noticed no changes at all. Audio works fine for me; YouTube, NetFlix, RadioTunes.....all behaving themselves sweetly. I now also have the Ubuntu Trusty build of Firefox 60.0 working in TahrPup 6.0.5 as well. Personally I would prefer this over the official Mozilla build because it will have been compiled specifically against Ubuntu Trusty libraries. The Debian ESR builds do not require apulse, but it seems the Ubuntu Quantum builds do. I was unsure about this at first. I just moved it there but it is effectively the same thing. I placed the 3 apulse 0.1.11 libraries inside the firefox directory and launch with a script as above. The libgtk-3 package from PPM is required as always. The long string is auto-generated and sound is working. Standard simple tweaks for the menu entry and it is all good to go. It may be just me being a bit distracted and not looking carefully enough (I am really supposed to be working on something else), but with the official build and starting from scratch (rather than via auto-updates) I think that the ownership may be an issue when a sandbox is involved. I normally check and make sure everything is root:root, but with firefox tarballs I was not expecting it to need this. Anyway, all is working for me in my tests here now, Mozilla or Canonical builds. Let me show you this from a working version of Firefox 60.0. I would say the setting restoration most deserving an investigation is the one where a value of "54" gets reverted back to "/dev/snd", by just rebooting. I think you are using this 54 in a place that it no longer applies. I would stop trying to change it to 54.
security.sandbox.content.level set at 2 could be your issue. My Firefox 60.0 security.sandbox.content.level is set at 4. I am still searching for what 4 setting does. All I can find is settings 0, 1, 2, 3 and what they do. Documentation is not updated with info on setting 4. The reverting back from 54 to /dev/snd/ after reboot might be caused by a user.js file which has previously been inserted in the profile by you (with this setting defined that way). Find and delete any such user.js file. My tests were all done on fresh boots with no save-file. TahrPup does not have its own version of Firefox in the .iso. If you remove everything including all previous main firefox directories from /opt and /usr/lib and also completely delete the profile in /root/.mozilla you should effectively be starting completely afresh again. To start with, make a backup of your bookmarks. Click on the Bookmarks icon; Bookmarks->Show all Bookmarks->Import and Backup->Export bookmarks to HTML. Save to a safe location. Don't bother uninstalling existing Firefox versions. Go here, and download/install fredx181's self-contained Quantum-portable (with audio already built-in, and set up). It's a .tar.gz file (a tarball); extract it to /opt. 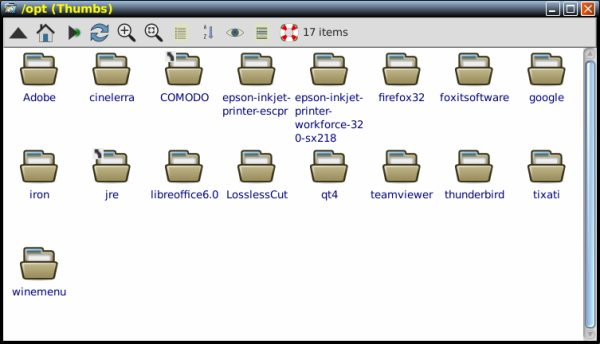 Note that in this case, the directory is named 'firefox32' (or 'firefox64'), as opposed to the usual 'firefox'. This will put an entry into the Menu to start it. When you start Fred's 'portable' for the first time, it creates a new profile inside the /opt/firefox32 directory. This is why I said not to bother deleting existing Firefox stuff, since this is all self-contained. Once it's started, go into 'Preferences', and set it up like bigpup's done in his previous post. Download the update, but ask you when to install it. Re-install your bookmarks. As above; Bookmarks icon, then Bookmarks->Show all bookmarks->Import & Backup. Then, 'Import bookmarks from HTML'. Click on 'Other Bookmarks'. Then, drag'n'drop stuff across to 'Bookmarks Toolbar' in the order you want them. Before you ask, no; this 'portable' FF will not 'pick up' your existing bookmarks.....because it doesn't read from /root/.mozilla and /root/.cache/mozilla. This has to be done manually.....but it only has to be done ONCE. Because once you've done this, you can run this in any other Pup.....by copying the 'firefox32' directory across to /opt of your Puppy of choice, and installing the MenuEntry.pet. I'm posting this from peebee's BionicPup.....but it's the same install that all my other Pups are using, because the 'firefox32' directory is sym-linked from a remote data partition into every single Pup. Including Tahrpup.....where it runs just fine. If this don't work for ya, you either have some very odd hardware.....or you can't (or choose not to) follow simple instructions. And, with the exception of doing the bookmarks manually, this is as foolproof as it comes, once set up. Changing content.level from 2 to 4 did not recover sound.